Located on Calangute Beach, Estrela Do Mar Beach Resort features an outdoor pool and 2 dining options. Wi-Fi access is available in public areas of the hotel. Baga Beach and Anjuna Beach are close to the resort, including other sites such as the Church of Our Lady of Immaculate Conception and Chapora Fortress. The air-conditioned rooms provide a ceiling fan and an ironing facility. The bathroom includes a makeup mirror and a hand-held shower head. Housekeeping is available. The Estrela Do Mar Resort provides a business centre, small meeting rooms, and car services for all guests. Tours, event caterings, computer rentals may be arranged as well. Guests can enjoy sunbathing by the outdoor pool, or reading at the in-house library. Dining options include the Patio Restaurant and Beach Side Shack which offers a variety of cuisines. 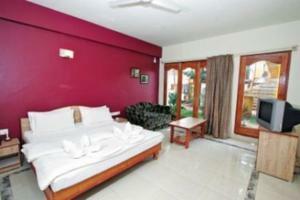 The resort is 14 km from Panjim bus station. It is 40 km from Dabolim Airport and Vasco Di Gama Railway Station. Free! Up to two children under 5 years stay free of charge when using existing beds. One further child from 6 to 12 years is charged INR 500 per night and person in an extra bed. One older child or adult is charged INR 750 per night and person in an extra bed. Maximum capacity of extra beds in a room is 1. There is no capacity for cots in the room. Any type of extra bed or child's cot/crib is upon request and needs to be confirmed by the hotel. Supplements will not be calculated automatically in the total costs and have to be paid separately in the hotel.